El President is back! In times of political turmoil and social unrest, the people are calling for visionary leaders, who will steer the fate of their country with foresight and ingenuity. 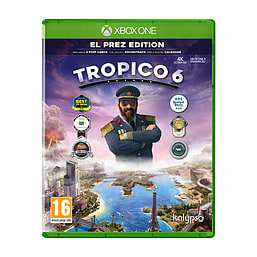 Prove yourself once again as a feared dictator or peace-loving statesman on the island state of Tropico and shape the fate of your nation through four distinctive eras. Face new challenges on the international stage and always keep the needs of your people in mind. For the first time in the series, manage extensive archipelagos, build bridges to connect your islands and use new means of transportation and infrastructure. Send your Tropicana on raids to steal the wonders of the world, including the Statue of Liberty and the Eiffel Tower. Customize your palace at will and give election speeches from your balcony, to win the favour of your subjects.